As with many women of her era, Barbara Bush was routinely underestimated, her contributions often neither recognized nor acknowledged. But she became an astute and trusted political campaign strategist and a beloved First Lady. She invested herself deeply in expanding literacy programs in America and played a critical role in the end of the Cold War. With her cooperation, this vivid biography offers Barbara Bush's last words for history—on the evolution of her party, on the role of women, on Donald Trump, and on her family's legacy. Barbara Bush's accomplishment and contributions are many. 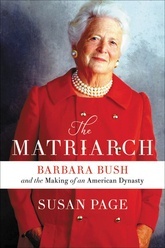 Now, Susan Page explores them all in a book certain to cement Barbara Bush as one of the most influential women in American history.